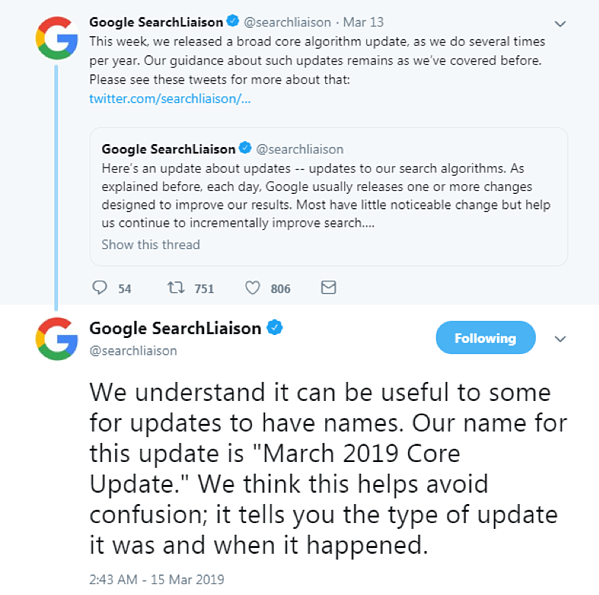 On March 12th, Google began releasing what they call a "broad core" algorithm update. An algorithm update is significant because it can— overnight —drastically alter a website’s keyword ranking, traffic and revenue from search. March’s algorithm update is the fourth in a series of updates made over the last year, including the now infamous Medic Update and the March 2018 Update. Those updates, in particular, aimed to fine-tune Google’s ability to recognize expertise, authority, and trust in websites (E-A-T). Widely discussed within the SEO community, E-A-T was also reviewed here on the Stella Rising blog. If you think that Google's recent update impacted you, reach out to our team for a complimentary algorithm impact analysis. After reviewing your site, we will schedule a call to discuss our findings. Regardless of whether you have been positively or negatively affected by the recent update, now is an ideal time to address SEO within your brand marketing strategy because Google changes will, inevitably, continue. If any of the updates negatively impacted your site, both Google and our team recommend that brands have an SEO professional review their website using the Google Quality Evaluator Guidelines. Implementing changes that improve upon a site's expertise, authority, and trustworthiness are smart not only for SEO but also for overall marketing efforts. Our team has processes in place for evaluating sites impacted by these algorithms, and we are here to help your brand make the necessary changes to incite improvements. Here is an example of a random sample site that we came across that was hit particularly hard. Note the peak in March followed by a concerning downturn. Below is an additional example from a Stella Rising client who experienced a surge of ranked keywords during this update. Maintaining the relevance of content and links and understanding the evolving landscape is critical in taking advantage of these Google updates. Algorithm updates can take away traffic, but they can also gift traffic to websites within Google’s good graces. In the case of the client below, reviews had been rolled out within the prior year, and so products on that site had more reviews than its competitors. Google releases a number of these types of updates per year, and so continual improvements to SEO and E-A-T are critical. The only way to see improvement is to make swift changes once your brand has been impacted. We recommend making addressing all SEO opportunities a top priority. A few quick fixes will not restore your pre-update status. Furthermore, the entire SEO program needs to be reviewed, not merely parts of it. E-A-T stands for expertise, authoritativeness, and trustworthiness. For Google, this means transparent information regarding who is responsible for the website, who authored the content, and how much of an expert they are. Google also looks for unique factors of E-A-T when evaluating different industries. Learn more about E-A-T in our earlier post about the Medic Update. Ready to find out if you were impacted? Contact us so that our team can conduct a complimentary algorithm impact analysis for you.